Discussion in 'Windows OS and Software' started by Ultra Male, Oct 6, 2015. Now the drivers will be installed completely because if you don't follow this method, then as soon as you run the setup regularly and hit next, you will notice that the installation completed and nothing happened. NOTE: You MUST re-install the Intel Rapid Storage Technology Drivers after you install the Intel Chipset Drivers because the Intel Chipset Drivers usually install their own AHCI Controller so you have to reinstall the IRST Drivers again if you were on RAID just to be on the safe side. 6.|THE|1|BOSS|.9, jaug1337, Vasudev and 4 others like this. 2. 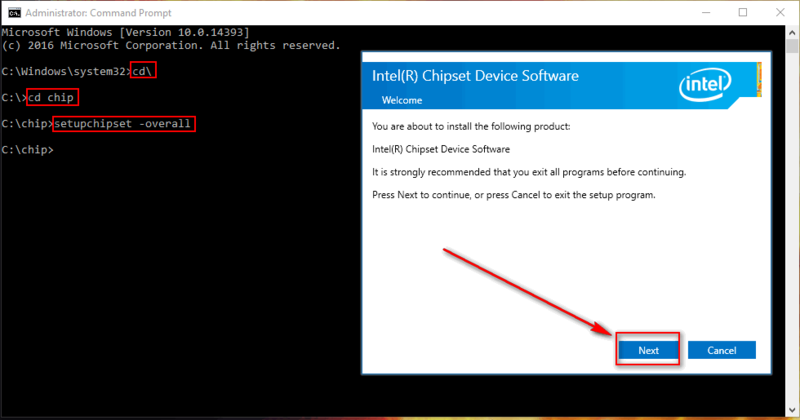 For full chipset driver reinstallation you can just create a shortcut of Setup.exe and add -overall in object tab. No need for cmd. 3. Actually you don't need to install chipset drivers if your OS already been working fine for some time. It's not actual drivers. It's just giving proper name for all devices so OS would know what it's dealing with. Links only give Win7 drivers, I have series 8 chipset and am looking for win8.1 x64 drivers. mind a question? How do we know its a 7 series or 8 series? I'm thinking of installing the USB drivers because my USB 3.0 refuses to power up devices (such as USB HDD). 3- new INF files (like the drivers the INFs replaced) can bring new *features* or expose them for use by the OS - same applies to utilities (such as the Intel Management Engine, which is actually part of the WMI architecture, but used by quite a few OS-native and third-party utilities - IME's biggest benefits are for SSDs; however, it requires either a 6xx or later chipset, even though you can use SSDs with any Intel chipset that supports SATA drives, even the moldie-oldie 865PE chipset). They are for Win 8 also, except the USB drivers for Intel are already built into Windows 8 you cannot install an updated one from Intel. I used this method for my Asus G750JW/JX/JH, and all my USB 3.0 devices started showing up correctly, and transfer speeds increased greatly. This method didn't work for the Asus G751, although many tried. I haven't tried this on my GT80 yet. Maybe you can try to restore full USB 3.0 to Windows 8.1? I used the newest Extensible USB 3.0 driver for Windows 7 each time I implemented it, and all worked fine. I haven't tried for about a year, so updates since then are untested by me. It says in the post that it isn't recommended for Windows 8.1, but I used it successfully on Windows 8.1 using newer Intel drivers. Thanks for this, I don't use Windows 8 so I cannot assist on this. @Matrix Leader , may I kindly ask for users like me (i'm using P157SM-A), I encountered a problem during installation (exactly the same as you posted on your first post here), so I'm thinking that my USB ports (including the E-SATA) ports not giving enough power to power on a USB-HDD is because my drivers are not up to date? Or is it a motherboard problem? Also, may I ask do these drivers exist for Windows 10 ? (assuming that these are usable for Clevo P157SM-A). Many thanks for advices in advance. 2.5" HDD? Guess you better buy Y USB cable. Bingo. Get a powered USB hub.